Dhara is a very ancient Ayurveda treatment system using mildly warm oil, and it’s a method well known all over the world. There are many varieties of Dhara in Ayurveda and all the Dhara’s are very result oriented and ensures curing of ailments. Dhara is an important therapy in Ayureda and it gives sudden relief from chronic headaches, insomnia, mental tension, hysteria, hallucination and insanity etc. Herbal oil, coconut water, milk, ghee, dhanyamlam etc. are the contents for preparing Dhara and this treatment is a quality contribution of the rishi medicinal science. Dhara has the convenience to prepare with different materials and as per the change of such things the name of the Dhara also changes. The main ingredient of every Dharas is medicated or herbal oil. It’ll take 14 days to finish a Dhara treatment course. It’s very amazing that Dhara gives quick remedy to many health problems and its meaningful treatment system of Ayurveda, which unveils the true values of rishi medicinal science. Dhara the treatment gets wide acceptance all over the world especially with westerners. 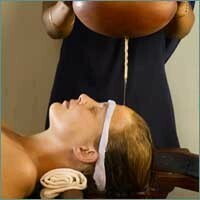 Dhara treatment is 100% pure and natural and it plays a key role to uplift the dominance of Ayureda to a global access.